Everything changes, they say – but does education ever really change? Technology has wrought change across the American landscape, transforming even our interpersonal relationships. The recent rise of massive open on-line courses (MOOCs) seems to fit with the rest of these experiences: the internet makes stuff better. But throughout American history we see reformers trumpeting a “transformation” in education. While Bagley’s point still stands, the MOOC seems to mount a structural alternative to the status quo that is different than most attempts at revolution. Online courses offer, apparently, the same thing as the Ivy League courses: top-notch lecturers, identical readings, just a smaller (or non-existent) price tag. MOOCs are democratic. Campuses are elitist. Entrepreneurs like Sebastian Thrun at Udacity allow underprivileged children in Detroit to learn coding with WASPs at Stanford. Even storied campuses such as MIT and Harvard are moving (partially) online with the launch of “edX.” All this can be good, provided no one gets carried away. The online education movement tempts gleeful iconoclasm. For years, the public has perceived colleges and universities as snotty institutions that over-charge for degrees with little practical value. MOOCs promise to refine the inefficiencies of academia in the pure fire of the free market. Bagley’s perspective is helpful to temper this enthusiasm. By 2050, technology may marginally improve the delivery of higher education, but don’t confuse the frosting for the cake. Here’s what we should expect – and what we shouldn’t. New technology makes it easy to transmit facts, information, and data. Education in highly technical fields like computer science and math don’t require much more than that. This is why, in a recent interview, Sebastian Thrun announced that Udacity would be moving its focus almost entirely to technical fields. Long before MOOCs, we’ve heard of self-taught computer programmers. 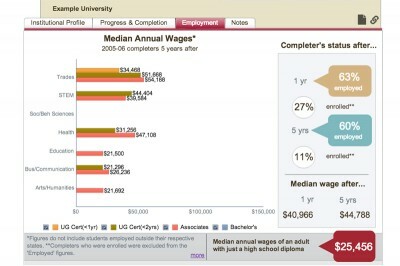 If you’re self-motivated, MOOCs are just another way to learn basic skills, but with degrees. Expect American universities to develop a diverse menu of choices for students, ranging from the traditional campus experience to entirely online courses you can take in slippers. Here, MOOCs recognize that some students see college as job training – and you don’t need four years in a dorm to learn many technical jobs or hard sciences. These subtle benefits of education don’t fit in formulas or spreadsheets. We acquire them in a three-way conversation between teachers, students, and the best that has been taught and said. Socrates didn’t shun a DVD lecture series for lack of BluRay players – he recognized that the teachers teach by asking students questions – and listening. And asking more questions. And, in Socrates’ words, caring about the “formation of their souls.” Skype with thousands of students will not do. We should be excited that MOOCs make information and job skills more accessible – just like libraries and Wikipedia. But lets not lose sight of this: eight times five MOOCs does not equal a university education. Luke Trouwborst studies philosophy at The King’s College in New York City. This essay was originally an assignment for a persuasive writing course. Follow him at @luketrouwborst. A MakerBot is a tabletop-sized device that takes digital designs and builds them in the real world, layer by thin layer, out of a plastic-like roll of filament derived from corn. You can create or customize any design you can think of– a working prosthetic hand, or a scale model of the Eiffel Tower, or a set of chess pieces–or download someone else’s design from the Thingiverse, MakerBot’s free online library. Comparatively low-cost and easy to use, MakerBots are the popular edge of what technology observers and futurists–even President Obama–call a “new industrial revolution” of mass customization, where design is democratized and manufacturing is one day as decentralized as knowledge production has become. Plus, they’re just wondrously cool. MakerBot CEO Bre Prettis used to teach public school in Seattle. “It’s always been a dream of mine to get this into more classrooms,” he says. This week he announced the MakerBot Academy to do just that. Teachers who want a MakerBot for their classroom are asked to register at the educational donation site DonorsChoose. There, their project can be funded through tax-deductible donations by individual donors. The architectural software company Autodesk has also agreed to sponsor a number of MakerBots, as has the director of MakerBot’s parent company, and Prettis personally is committed to funding them for high schools in his current home neighborhood of Brooklyn. For any teacher, MakerBot is making available a package of the printer itself, three rolls of filament, and a service and support plan at $2000, a $700 savings over the retail cost. “A MakerBot is a manufacturing education in a box; it unlocks creativity and gets kids thinking about how things work,” Prettis says. He sees the machines functioning in classrooms in a range of ways. On a practical level, MakerBots could be a relatively affordable way to furnish a steady stream of new materials and supplies for classrooms that might not otherwise be able to afford them, from a detailed model of a human heart to simple machines for use in physics. To start out, DonorsChoose told MakerBot that one of the most commonly requested items are “math manipulatives,” the blocks, wedges, counters and other toys that help kids learn geometry, arithmetic and more. MakerBot put out a design challengeto its Thingiverse community to submit ideas for new and creative manipulatives that can be downloaded, printed and used in classrooms. It’s exciting to think about students and teachers in different communities creating and sharing their own designs for classroom purposes. MakerBot is going to be sharing curricula created by teachers and companies like Autodesk to help teachers work the 3-D printers into lesson planning from kindergarten through high schools. Within the world of K-12 innovation, we’re oftentimes focused on the use of handheld devices with screens, but learning can be an intensely tactile process, and the MakerBot taps into that. “A MakerBot is actually a great bridge between the virtual and physical world,” Prettis says. This post was produced by The Hechinger Report, a non-profit journalism organization housed at Columbia University in New York City. 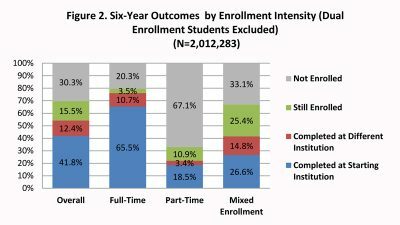 Four and a half years after producing more degree-holders became a national priority, graduation rates remain stubbornly flat, and only slightly more than half of all students continue to finish four-year programs within even six years, according to a new analysis.The study, by the National Student Clearinghouse, found that the percentage of students who graduated within six years after starting toward either a four-year or a two-year degree is 54.2 percent, up only two-tenths of 1 percent from last year.Of those, 12.4 percent finished at institutions other than the ones where they started. Another 30 percent of students dropped out, and 15.5 percent were still enrolled. Though the overall average was virtually unchanged overall, public four-year institutions slightly improved their graduation rate, by 1.3 percentage points, and community colleges by 1.1 percentage points. In all, 37.4 percent of community college students completed school within six years—9 percent of them after transferring to four-year institutions. Community colleges have long complained that their low graduation rates do not reflect that many of their students transfer and finish elsewhere. This post was produced by The Hechinger Report, a non-profit journalism organization housed at Columbia University in New York. Facing stagnant enrollment and increasingly price-conscious consumers, already cash-strapped universities will continue to see their revenues fail to keep up with inflation, the bond-rating agency Moody’s Investment Service says. The proportion of public universities with expected revenue declines has doubled over last year. Nearly 30 percent of public and one out of five private universities will suffer declines in revenue—more than the proportion that experienced this last year, and a sign that the problem is getting worse and not better, according to Moody’s, which annually reviews the financial condition of higher-education institutions whose bonds it rates. Nearly half of universities expect to see declines in their enrollments. Second-tier public universities and small private universities that are having trouble persuading families and students that they’re worth the price of their tuition are in the most danger, Moody’s says—and will have to take dramatic steps to win back business. “At this pace, tuition-dependent colleges and universities will be challenged to make necessary investments in personnel, programs, and facilities to remain competitive over the longer term,” says Karen Kedem, a Moody’s senior analyst, who authored the report. Forty-four percent of public and 42 percent of private universities and colleges will see their revenues fall behind the 2 percent inflation rate, Moody’s says. That’s largely because private universities are being forced to give higher and higher discounts to keep students coming. Public universities, meanwhile, are being squeezed between cuts in their allocations from state legislatures and resistance to shifting their costs onto students and their families in the form of higher and higher tuition. The proportion of public universities with expected revenue declines this year is twice what is was last year. Moody’s warns that cuts in federal financial aid during an era of austerity would push universities onto even shakier ground. The emerging world of K–12 blended learning remains a young field full of promise for personalizing learning and boosting outcomes for all students. More and more bright spots are emerging every day. But there are also challenges. With the buzz surrounding 1:1 device programs and new classroom apps, there are risks that people might just take education technologies and layer it over the existing monolithic classroom processes and not fundamentally change the way students learn. The hype around and cramming of technology remains a serious risk to the field. To help educators make the shift to blended learning that truly moves the needle for students, we’ve been working for the past few months with Silicon Schools Fund and the New Teacher Center to create a MOOC on Coursera about high-quality blended learning. The free course launches Tuesday. Diving into the online-learning revolution about which I’ve written and spoken so much for the last seven years by actually creating an online learning experience has been a fascinating and humbling experience. Without the hard work of an entire team—from our team at the Clayton Christensen Institute to our partners and friends at the Silicon Schools Fund and New Teacher Center and from our videographer Eric L. Wong to The Learning Accelerator, which provided support—it’s been clear to me that we could not have pulled this off. This has made me appreciate so much more the hard work of those instructional designers who work to create high-quality online learning experiences for their full-time job—as well as how early we are still in the emergence of the newer MOOC platforms. It also makes me further wonder about the quality of much of what has been placed on the MOOC platforms to date. Below are a few behind-the-scenes shots of the making of the MOOC. Videographer Eric L. Wong and Michael Horn review some notes during a MOOC film shoot. Photo by Anna Gu. Caitrin Wright of the Silicon Schools Fund and Eric L. Wong working during a filming session with Rob Schwartz. Photo by Anna Gu. Our six-week course draws from interviews with a number of practitioners in the K–12 world of blended learning about how they have combined online learning with thoughtfully designed face-to-face interactions to create dramatic gains in student learning. We examine the critical element of mastery-based learning, the motivational benefits of greater student ownership over learning, and the opportunity to boost students’ non-cognitive skills in these environments. We also look at gains from the perspective of blended-learning teachers, whose roles shift into more targeted “guides on the side” who are able to develop deeper relationships with students. Three schools act as our protagonists throughout the course to give course participants a real view into why to do blended learning and how to do it: KIPP Comienza Community Prep of KIPP LA, Gilroy Prep of Navigator Schools, and Summit Denali of Summit Public Schools. These schools provide a window into how blended learning works on the ground at various levels—for students, teachers, and administrators. We could not have created this course without the amazing cooperation and insights from the students, teachers, and leaders at these schools. It’s of course impossible to capture all of the valuable insights that these schools have to offer about blended learning in one day of filming at each school, which made the sessions challenging. But these days were undoubtedly the most rewarding and enlightening—not only for us, but we also suspect for those who take the course. Brian Greenberg and Eric L. Wong discuss a camera angle during a film shoot at KIPP LA. Photo by Michael B. Horn. They also provided some great light-hearted moments with the students that kept us focused on the ultimate reason for this work. Brian Greenberg dons an elephant hat while interviewing a student at KIPP LA. Photo by Michael B. Horn. What we’ve learned–and what emerges in the course–is that there is no definitive way to do blended learning. The schools that we profile have made many different decisions and all produced wonderful results for students. In the course, we also expect to learn a lot from the participants, who will take ownership of their learning by constructing a blended-learning experience in their own context as their primary assignment. In the process, we believe that they will create a host of new innovations and make a series of novel choices around blended-learning design. With over 10,000 students signed up from literally around the world—one of the most exciting moments occurred within hours of opening up the course page this past Friday, as students began discussing a range of blended-learning topics—we are pretty certain there will be something for everyone in this course. And that means that the making of the course will truly be a collaborative—and ongoing—process. At the end of the experience, I’ll try to report out once again some of the high-level takeaways. We’re excited to get going and keep learning. For example, early payments made by borrowers to reduce their long-term interest costs end up being applied to lower-interest loans first, and not higher-interest loans, while partial payments are parceled out in the opposite way, which maximizes late fees. And when student loans are transferred from one servicer to another, the resulting confusion often costs consumers even more money. “Too many borrowers have to run through an obstacle course to get their payments processed properly,” says Rohit Chopra, the CFPB’s ombudsman for student loans. One reason is that loans are often sold back and forth among borrowers, much like mortgages, the CFPB report says. It says consumers complain of lost paperwork, bank errors that result in late fees, and other problems. It says the complains mirror problems in the mortgage market after the financial crisis, when borrowers couldn’t refinance or modify their mortgages, or were foreclosed on when their paperwork got lost by lenders. “Too many borrowers have to run through an obstacle course to get their payments processed properly.” — Rohit Chopra, CFPB ombudsman for student loans. “The similarity between private student loan complaints and problems uncovered in the mortgage servicing industry suggests that many student loan servicers are not taking proactive steps to avoid a similar breakdown,” the report says. 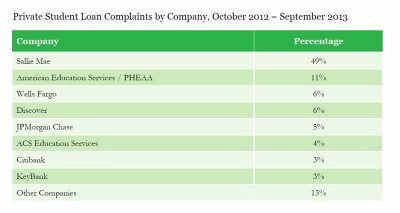 Almost half of student borrower complaints were against Sallie Mae, 11 percent against American Education Services, 6 percent each against Discover and Wells Fargo, and 5 percent against JP Morgan Chase. The CFPB says these are proportionate to their respective shares of the market. Eighty-one percent of students who borrow more than $40,000 use private loans, which typically have higher interest rates and stricter repayment terms than federally backed loans. 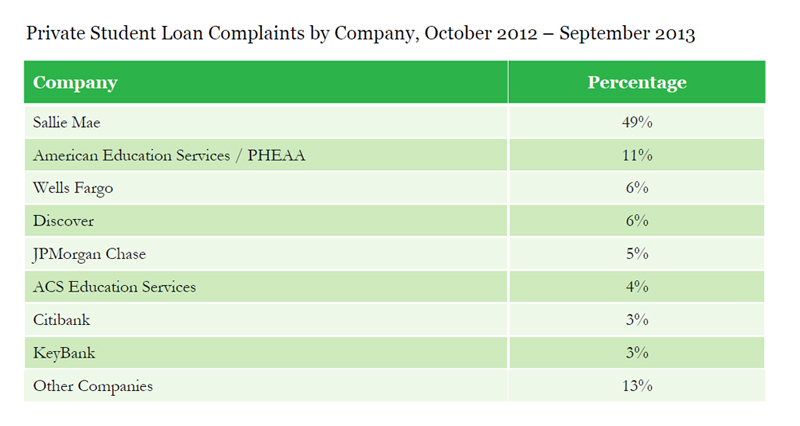 The CFPB reported 3,800 student-loan complaints between October 1, 2012 and September 30, 2013. There are other drawbacks to letting universities rate themselves. One is that the information is self-reported, and not independently verified, potentially inviting manipulation of the figures. In the last two years, seven universities and colleges have admitted falsifying informationsent to the Department of Education, their own accrediting agencies, and U.S. News: Bucknell, Claremont McKenna, Emory, George Washington, Tulane’s business school, and the law schools at the University of Illinois and Villanova. Last week, The Learning Accelerator, a non-profit that supports the implementation of high-quality blended learning in American school districts, announced its first district-wide pilot for blended learning with the Reynoldsburg City School District in Reynoldsburg, Ohio. A critical part of The Learning Accelerator’s definition for high-quality blended learning is that the learning be mastery-based (also known as competency-based) — that is, students make progress when they master a concept, not based on time. The CEO of The Learning Accelerator, Scott Ellis, has done a lot of thinking about how Kung Fu is a useful analogy for thinking through what mastery-based learning would look like in our K–12 schools, so I interviewed Scott to learn more. Q: How did you get involved in Kung Fu? A: Three years ago I started learning Kung Fu. I was signing my kids up to take classes and had always wanted to try it. When I told the instructors, they were confused: “You mean Tai Chi, right? It’s nice and slow, better for you. Kung Fu is fast, good for the kids.” In my first class a few days later I was breathing hard and my face was red. It took a while to convince them I was not going to have a heart attack. Today I am a brown belt, which means I have completed 9 of the 13 levels. Q: What does Kung Fu have to do with public education? A: Kung Fu offers an interesting example of a system of mastery-based learning: enabling students to learn at their own pace and advance as they master content, rather than moving forward based on time requirements. Q: Mastery, or competency-based, learning is being explored a lot right now in American education. But it would be a significant change from the current system in which all students move at the same pace in their classes. How does it work in Kung Fu? A: The structure of progression in Kung Fu is based on belt levels. In class, students wear a cloth belt of the color that shows their level. Students start with white belts and as they master new content and skills they are awarded new belts: yellow, green, etc., until the top level—black. To receive a new belt, a student must demonstrate mastery of several different elements: a series of moves called a “form,” a specific kick, two self-defense maneuvers, strength, flexibility, and endurance. These requirements are what, in K–12 education, would be called “standards”: what students are expected to know and be able to do. In Kung Fu a student advances when she can demonstrate that she has mastered the required content. Q: What does that look like in a class? A: When the class starts, students line up in order of their belt level, starting with the most advanced. Students do the 10-minute warm-up phase together: stretching, running, and basic exercises. Students also do the 20-minute technique practice together, with everyone working on the same element (e.g., kicks). Each student, however, works on the kick for her level, and the less advanced watch and learn from the more advanced. Students separate by ability level for the 20-minute forms phase. Each student takes a turn to show what she learned in the previous class and receive corrections, and then learns the next few moves of the sequence. The instructor rotates among the groups of students and returns to each group multiple times during the session. In the 10-minute physical fitness phase, the students do push-ups, sit-ups, and other exercises together. Q: What is the role of the teacher in all this? A: The instructor plays a central role in the learning process by serving as a role model and motivator and providing differentiated instruction. Key drivers of instructor effectiveness are their own deep knowledge of the material and their keen awareness of each student’s current stage of learning and the support each needs to move forward. Q: How does a student demonstrate mastery and progress to the next belt? A: Once the instructor is satisfied that a student has mastered all elements of her level, he tells the student that she is ready to take the “belt test.” Students cannot take a belt test until the instructor tells them they are ready, and they must also demonstrate that they remember all required elements of every previous level. The belt test occurs in a separate session from a normal class. Each element is tested separately: endurance, forms, kicks, and so forth. For each element the instructor grades the student as “excellent”, “satisfactory”, or “unsatisfactory.” If a student is graded unsatisfactory on more than two elements, then he fails the belt test. He may have to come back to another belt test session in the future, or the instructor may allow him to practice the element and then demonstrate it in the next class. Q: How does this apply to our K–12 education system? A: There are a number of aspects of Kung Fu that may be relevant for mastery-based learning in schools. 1) There are clear and defined standards. It is clear to students what they must know and be able to do in order to advance. The transparency is empowering and exciting for students as they see the path ahead. 2) There is a specific mechanism to demonstrate mastery. Although nothing in Kung Fu is quantitative, the instructor assesses every student’s ability to complete each element. Success or failure is binary. Instructor judgment and knowledge are essential parts of this process. 3) There is a mastery-based progression, which is driven and controlled by the student. Each student moves at her own pace. The time spent at a particular level is irrelevant. Some students attend one class per week; some attend several. Some practice at home; some don’t. Some take other classes like dance that build complementary skills and enable them to advance faster. 4) There is a combination of shared and individualized learning. Social interaction and community are fostered by the parallel portions of the classes (warm-up, technique practice, and physical fitness), while at the same time students advance at their own pace and receive focused instruction that enables them to move forward when they are ready. 5) Instruction and assessment of mastery are separated. The student learns a certain group of skills until the instructor determines they are ready to demonstrate mastery. The assessment process is separate from the learning process, though the assessment session is an opportunity to reinforce learning. 6) There is a public signaling of the level of mastery. Students wear belts that everyone can see, and students line up based on their belt level. This is a contrast to other mastery-based examples like swim classes, where students may be grouped by ability level and receive an award ribbon when they reach a new level, but the ribbon is something they take home. 7) There is public recognition of a student’s progression. When students pass a belt test, they receive their belt at their next class. When the class ends, everyone sits down, the instructor calls the student to the front and awards them their new belt. Everyone applauds. 8) Students help each other and model skills. Since activities are parallel across belts (all have kicks, forms, etc. ), there are many opportunities for students to help each other. Because advanced students do common activities first, the less advanced students see multiple demonstrations of good performance—not just from instructors, but also from their peers. 9) Finally, a broader range of content is taught than is tested. Students learn things in class that are not part of the belt tests. For example, students often do sit-ups, conditioning drills, and flexibility exercises, such as forward and backward splits, that are not included in the testing process. Q: What’s the big takeaway? A: Examples of mastery-based progression like Kung Fu offer models that could help transform American K-12 education. As policy proposals are considered in the months ahead, it is important to examine the underlying structure of America’s education system. Most fundamentally, students should advance when they master content, not based on outdated time requirements. Although not every student in America will become a black belt in Kung Fu, every student should receive the benefits of mastery-based learning. After barely more than a year in business, opposite-coast rivals edX and Coursera have become two of the biggest higher-education organizations in the world, with a combined six million registered users drawn to the online teaching they provide. What limited research has been done into the effectiveness of online learning has found that it has much higher dropout rates and lower grades than the conventional kind. Proponents of conventional education, which at first seemed unsure of how to respond to the MOOCs craze, now are publicly questioning them at conferences with titles such as, “MOOCs: Revolution or Just Passing Fad?” and “Will MOOCs Pass the Test?” and speakers including prominent education scholars. Employers still prefer hiring applicants with traditional versus online educations, according to a new poll. And even advocates for MOOCs concede that expectations have gotten out ahead of them. Even as MOOCs remain wildly publicly popular—enrollment in all online courses is up 29 percent since 2010, during a time when the number of students in conventional university courses has declined according to the Babson Survey Research Group—their purpose remains misunderstood, Agarwal and others say. While edX and others will continue to offer their immensely popular standalone online courses, the broader idea, they say, is largely to find ways of using new technology to improve the quality of education on campuses in what’s known as blended learning. They say that’s one of the main reasons MIT and Harvard are investing $60 million in edX. This work is in its early stages, with large-scale research just getting under way and some professors who teach MOOCs importing some of the technology—archived lectures, for examples, that students can watch, restart, and watch again—into their real-world brick-and-mortar classrooms. This combination of MOOC-style technology with conventional teaching has an acronym of its own, a geeky inside joke that’s likely to become as ubiquitous as “MOOC”: the small private online course, or SPOC. Work has only just begun into determining whether this will help students learn more. But what real-world experience exists so far is raising doubts. In a study of MOOC-like online courses at community colleges, researchers at Teachers College, Columbia University found that nearly twice as many students dropped out than their counterparts who took the same courses in conventional classrooms. The online students also got lower grades and were less likely to ultimately graduate. And in an experiment at San Jose State University in California, only half of students who were allowed to take MOOCs for credit passed, compared to three-quarters of those in the same courses in conventional classrooms. That’s because online learning requires self-discipline and motivation, says Amin Saberi, cofounder of another Stanford spinoff called NovoEd, which is betting that MOOCs can only work if students are called upon to do more than watch lectures on their laptops or tablets and check off boxes on online exams. In a new twist on MOOCs, NovoEd offers massive online courses but also organizes online and in-person study group and requires students to work on projects or find living, breathing mentors. Some in a technology entrepreneurship course started their own companies, for instance. “Can these enormous numbers really be taught all at once? When there is no actual communication with the students, is it still teaching?” Thierry asks. It’s too early to say, Agarwal insists. He says MOOCs are accomplishing their objectives of widening access to education and allowing educators to do research into how students learn—what times they like to watch the lectures, where they move forward or get stuck, and other precise details the technology can track. As for their third goal, of improving the quality of learning, he says, that will come with time.